Siva's Blog | A Blog on ADF, WebServices, SOA, OSB and others that excites me…. It has been 5 years since docker brought containers into the mainstream production environments that changed the way of application development and deployment. This link gives a quick overview on why companies are considering container technologies. I can say that i lagged behind in exploring docker so i tried some hands-on with docker recently so i wanted to post a few articles on the things i tried. Docker has great documentation so i will try to keep my posts simple and concise and give those documentation links wherever applicable. In this post, we will look at docker installation and ways to create docker images and containers. I used Ubuntu 17.10 (artful) VM with docker version 17.12.1-ce in Windows 10 based laptop. 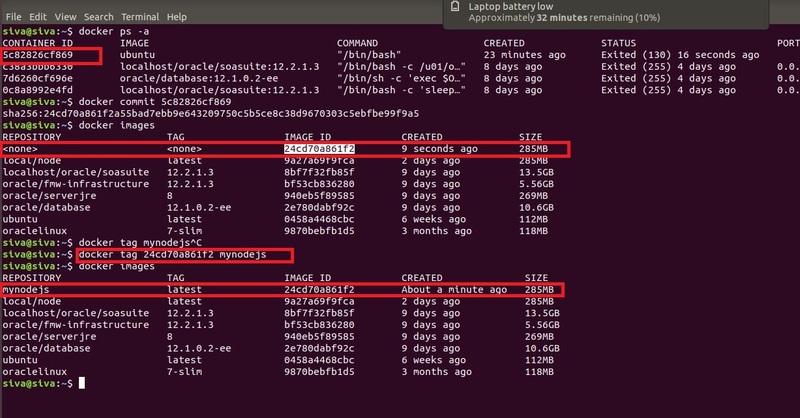 Old versions can be uninstalled using sudo apt-get remove docker docker-engine docker.io. Refer to documentation for more information on installation. To verify docker installation, sudo docker -v.
To avoid using sudo for running docker commands do following. Refer to this link for more information. Go to Show Applications -> Network -> Network Proxy to update system wide proxy settings. If still facing issue from command line, edit /etc/bash.bashrc to add following lines and reopen terminal. If it’s required for the current session, just issue the same commands at command prompt. To make apt-get working, create a file named apt.conf in /etc/apt directory with following lines as root user (sudo su). 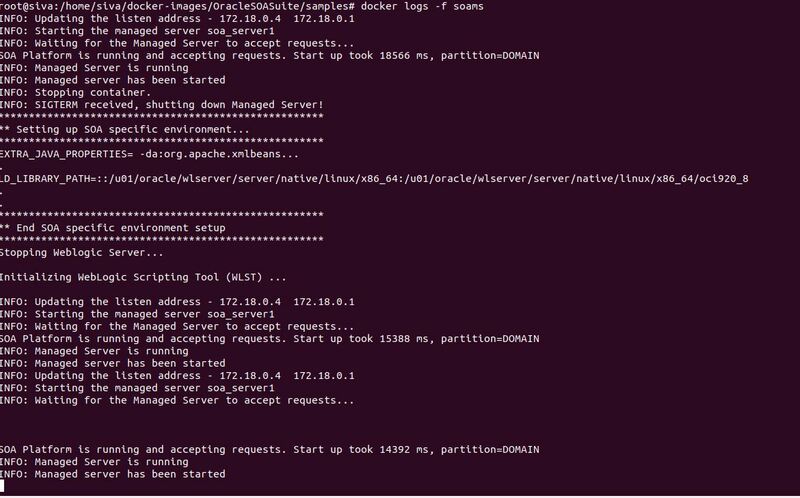 Docker daemon also needs to connect to internet to pull and push images. Do following to let docker to use your proxy. Create http-proxy.conf with following contents as root user(sudo su) and copy to directory /etc/systemd/system/docker.service.d. Refer to this link for more information. Restart the docker daemon so that proxy settings will be effective. Image is like an installation including everything like code, configuration, runtime etc and container is running instance of an image. Use docker run to create a container from an image. 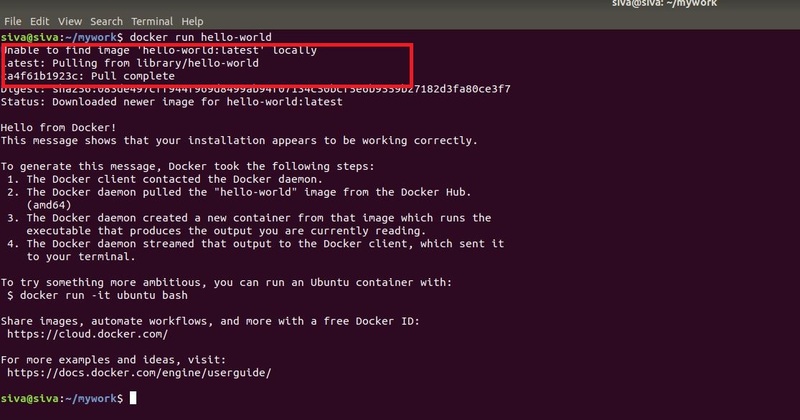 For example, issue docker run hello-world as shown below. Docker first checks for local availability of image and downloads from docker registry if the same is not found. Do docker ps -a to see all containers and use docker ps to see only running containers. In above example, the container is created from hello-world image, prints the message and exits the container. Since this image is not available in local it gets downloaded as shown above. Do docker images to see all local images. Now let us start an interactive ubuntu container using docker run -ti ubuntu /bin/bash. This starts an interactive container and also downloads an ubuntu image if not present in local. The -i option makes container interactive and the -t option attaches it to terminal. Observe hostname is nothing but the container id using docker ps. Each docker image will have a base image and can be built manually or using a file called Dockerfile. We will see both of these approaches using a sample nodejs application. Note that its always recommended to use official image provided by nodejs. 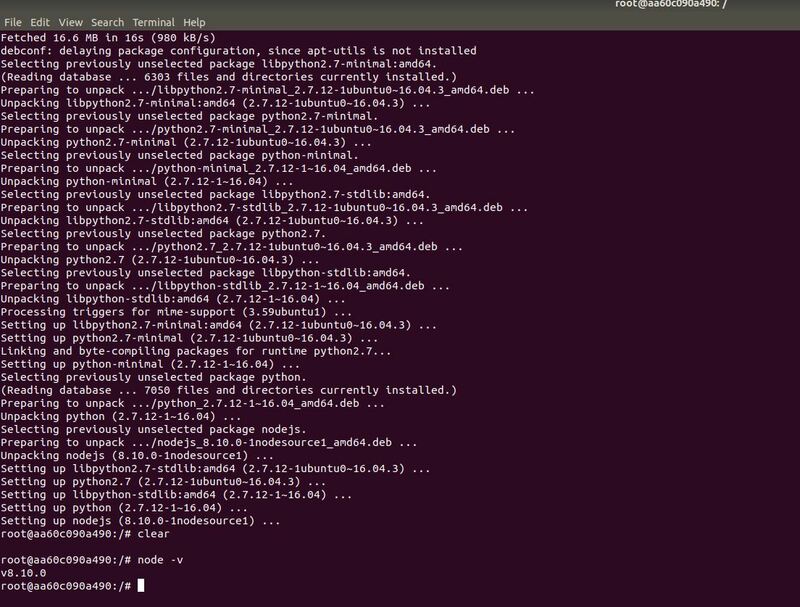 Do following to spin up a new container based on ubuntu image and install nodejs v8. 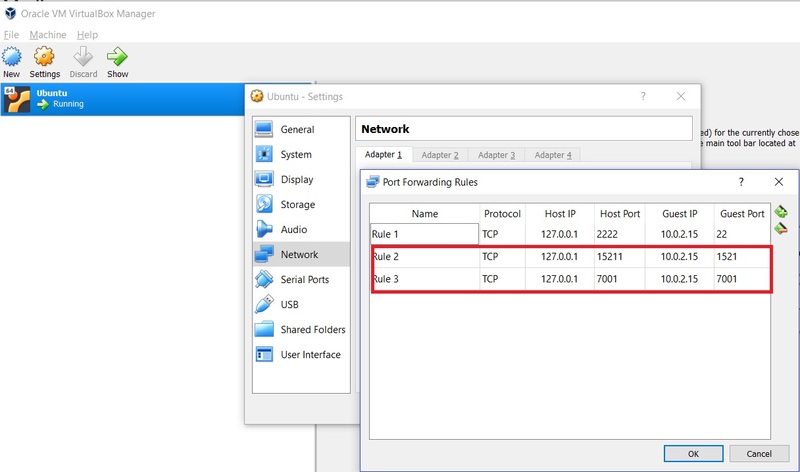 -p option is used for port forwarding i.e. connecting to 8888 port (first argument in command) on docker host will forward the request to port 8888 in docker container. 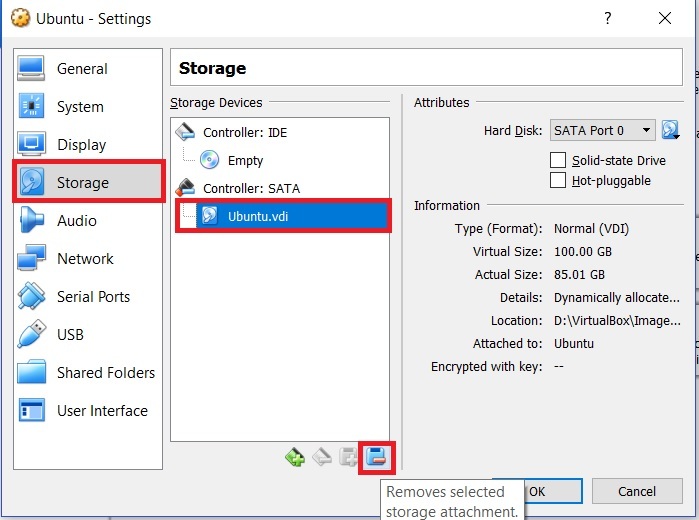 -v option mounts the file system so that container can access it. in my case, i have sample nodejs module in directory /home/siva/mywork (first argument in command) so i mounted this directory to access it in the container using same path. Now copy nodejs module from docker host to container as below. Run node movieservice.js and access service using browser url http://localhost:8888/movies. exit the container and find container id using docker ps -a. Creating docker images manually may not be possible always and also collaboration can become difficult with the above approach. So docker provides another way of building an image from file called Dockerfile that can have a set of instructions. All manual steps we did earlier can be incorporated in Dockerfile and build image from it. The mynodejs image created above, does not start node server as soon as container starts. Observe that we started the node server manually by issuing node movieservice.js command. We will make it happen using a Dockerfile and build a new image from it. So create a file named Dockerfile with following instructions. I have taken this example to make a point that even images created by us can be a base image. Note that Dockerfile should always start with FROM instruction specifying base image. CMD instruction is used to specify command to be executed when new container is started..
docker build -t samplenodeappl . Note that above command is to be executed after navigating to directory having Dockerfile. Now instantiate new container using docker run -ti -p 8888:8888 samplenodeappl. Verify that node application is up and running using url http://localhost:8888/movies. Create an user at hub.docker.com. Observe that image name should be tagged something like svgonugu/samplenodeappl containing your repository name. Login to docker hub to find this newly uploaded image. Images can be downloaded using pull command as highlighted above. Just to verify, we can delete the local image and pull it from repository. 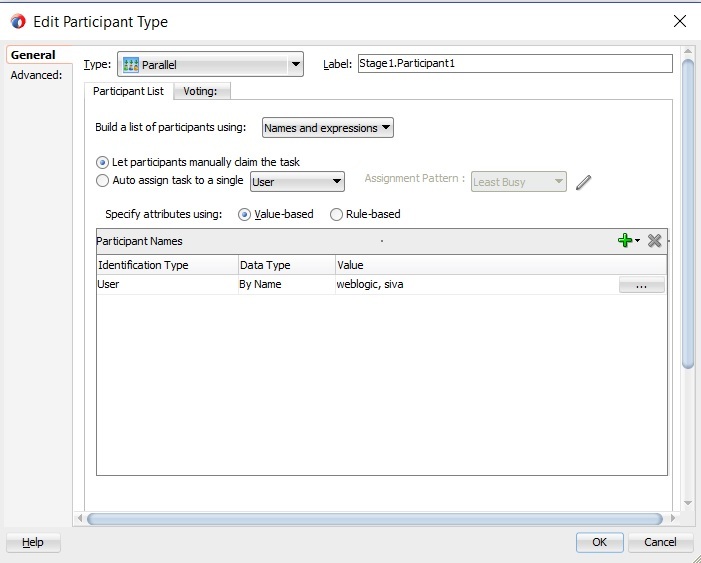 In this post, will show you how to add task attachment using BPM java api. For demonstration, i am taking simple string for input stream and same can be extended to any file. The commented lines in the above code is another way of achieving the same. 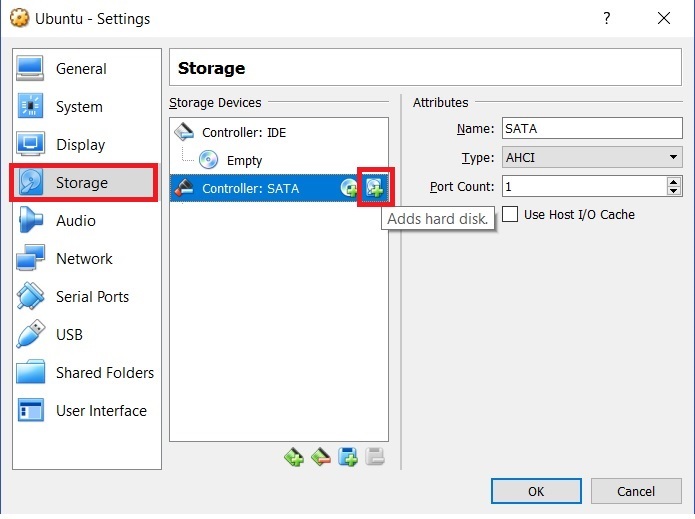 Pass root task id or any child task id for this method call. We can verify this attachment in WFATTACHMENT table as shown below. When roottaskid is used to add the attachments, the task form will show this attachment for all child tasks. addAttachment API is inserting an entry into WFATTCHMENT table even when there is no task id passed. The above behavior can be used in a scenario when we want to add task attachment task creation. To make this works, set the correlation id in attachment type like below and use the same correlation id during task creation. By default Admin, Approvers, Assignees, Reviewers, Owner and Creator can add attachments to a task which is configured in Access tab of human task as shown below. We will get an exception when unauthorized user trying to add the attachment as shown below. exception.name: Current user does not have the ADD privilege on task attribute: ATTACHMENTS. exception.fix: Grant the ADD access for the current user/role. If the error persists, contact Oracle Support Services. In this post, will show you how to manipulate Custom attributes using BPM java API. WFTASK table has the following columns along with columns used for public/private flex fields (Mapped attributes). Refer to this link for more information on mapped attributes. 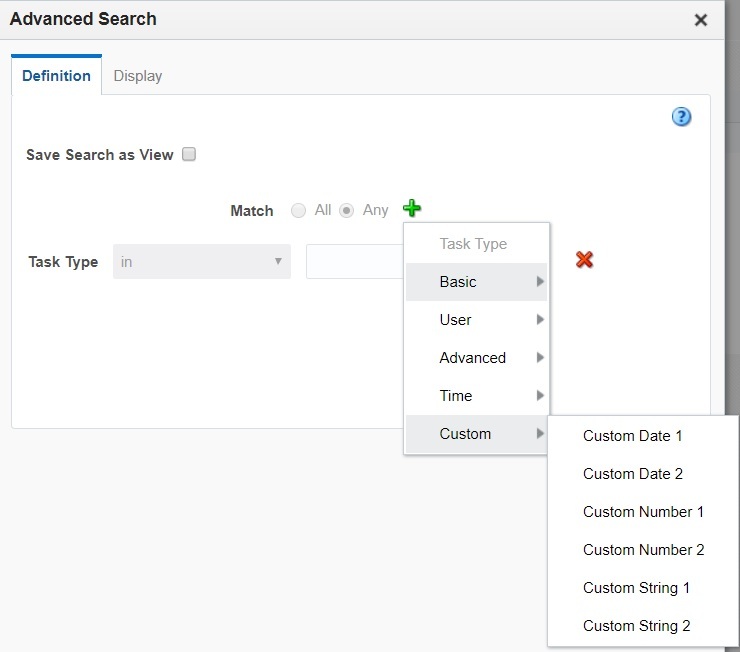 BPM worklist also provides a search on these custom attributes as shown below. So when we are creating any custom worklist or in some other scenarios we can always populate these custom attributes using java apis. To test this, send task id and values for custom attributes. We can use the following query to check the values. We can update these attribute values by passing roottaskid also. When we update only one custom attribute its setting other values to null. To verify this, you can do first iteration by passing both attribute values and pass only one of these attribute values in second iteration of method calls. When custom attributes are set during human task creation using apis, same set of values will be copied to roottaskid and all child tasks. In this post, we will see how to use BPM java api to add comments to human tasks. 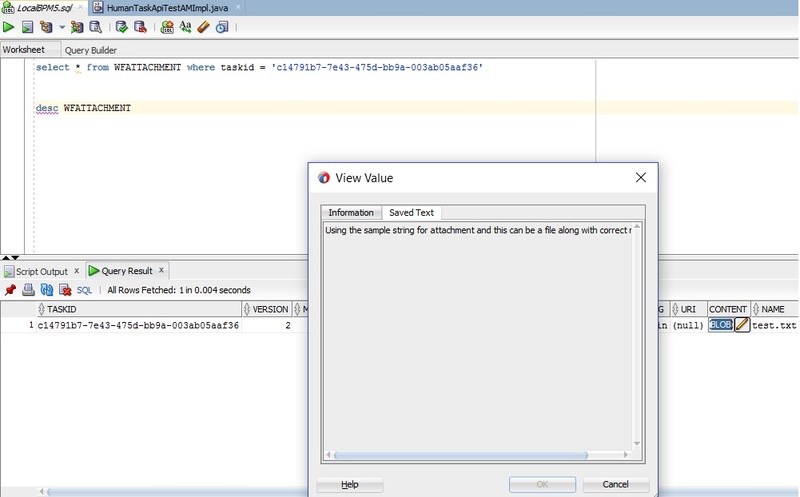 Task Service provides different methods to add comments to a human task as shown below. I will show you how to make use of the method accepting CommentType as argument and using other methods is simple and straight forward. Get the child taskid using roottaskid which has to be passed to the above method. After executing the above method, we can check the comments using the following sql query. Following piece of code demonstrates the approach to use Task object to add the comment. Following is another approach of adding task comments using TaskService.updateTask method. RootTaskId also can be used to add the comments. By default, Admin, Assignees, Owner, Creator, Approvers and Reviewers will have the write access and this can be modified in Access tab of human task definition as shown below. When a user attempt to add comments who does not have access, we will observe the following error in logs. We can reproduce this issue by turning off the write access for Approvers and Assignees in Access tab of human task. Also create the workflowContext using the user siva as siva is the assigness and approver here. exception.name: Current user does not have the ADD privilege on task attribute: COMMENTS. In this post, we will see how to withdraw a task using BPM Java API. 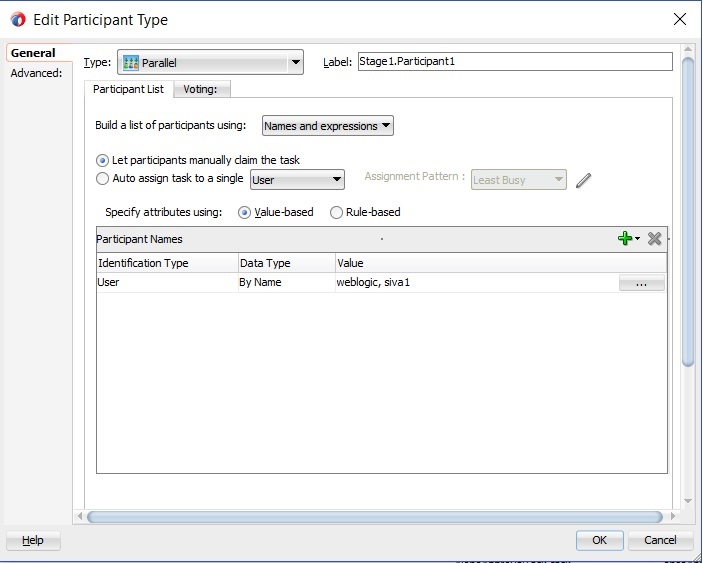 I will use a human task having parallel participant for the demo purpose as shown below. Following is piece of code to be used for withdrawing a human task. Note: we should destroy the workflow context when there is no need of the same which is not shown here. 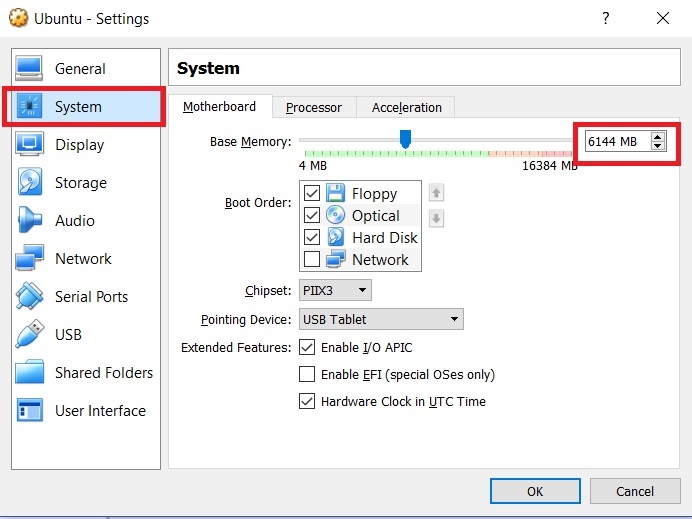 Task Service has another variation of withdraw method where we can pass the task object as shown below. To test this code, create a task and query the WFTASK table using roottaskid as shown below. Observe that 2 child tasks are created for the roottaskid as we are using parallel participant with 2 approvers. Now execute the above method by passing roottaskid. Query the WFTASK table again to verify all tasks are marked as WITHDRAWN as shown below. Using roottaskid for withdrawal will result into withdraw of all child tasks. The above statement is true even if some of the child tasks are in approved/rejected state. In this case, using roottaskid will withdraw only the eligible child tasks. The above statement is also true even if some of the child tasks are in ALERTED state. Typically tasks get into this state because BPM runtime unable to resolve the assignee. In the following screenshot, the user siva1 is not existing in my server hence the created task is in ALERTED state. By default, Admin, Creator and Owner of the task can do withdraw of a task. we can see this information in Access tab of human task editor in jdeveloper. Observe the usage of Admin WorkflowContext in the above code. We will get an error like below when unauthorized user try to withdraw the task. To reproduce the error, we can create the task using weblogic user and try to withdraw that user using another user who is not admin, creator and assignee. exception.name: Insufficient privileges to access the task information for this task. The task must have either expired or assigned to another user. exception.description: User siva cannot access the task information for task: fd1df834-04b3-4a5f-a7b5-8bbf83f8dc72. exception.fix: Ensure that the user has been granted appropriate privileges to access the task information for this task or check on expiration and esclation policies. We can get owner, creator and assignee details for a task using following sql query against soainfra schema. Often there is a need to interact with credential or policy store from java/ADF code which requires code source grants/system policies. Typically the application’s jazn file will have these values like the following. Use the following steps to provide these grants through EM Console. If we observe these actions, we can guess that all users of the system should not be able to perform these actions and should be controlled through roles/privileges/permissions. So all these actions requires a user context to determine these permissions. BPM APIs accept this user context in form of WorkflowContext. WorkflowContext is a session object maintained by SOA server tied to an user. How to create workflowcontext for a specific user? Task Query service has authenticate method that accepts user credentials and returns a WorkflowContext as shown below. How to create workflowcontext for a logged in user? Same Task Query service is used to get workflowcontext for the logged in user as shown below. Make sure that your java/web application is security enabled. How to create workflowcontext on behalf of a user? In some of the cases, password may not be available to get the user context but the task actions should be performed by this user. In those cases, we can create admin workflow context and use authenticateOnBehalfOf method of Task Query Service as shown below. Here the user weblogic is admin i.e. having BPMWorkflowAdmin role. How to assign BPMWorkflowAdmin role to an User? Login to EM console and navigate to Weblogic Domain -> <<domainName>> -> Security -> Application Roles. Search for BPMWorkflowAdmin role by choosing soa-infra as application stripe. Click Edit to assign this role to an user and click Add. 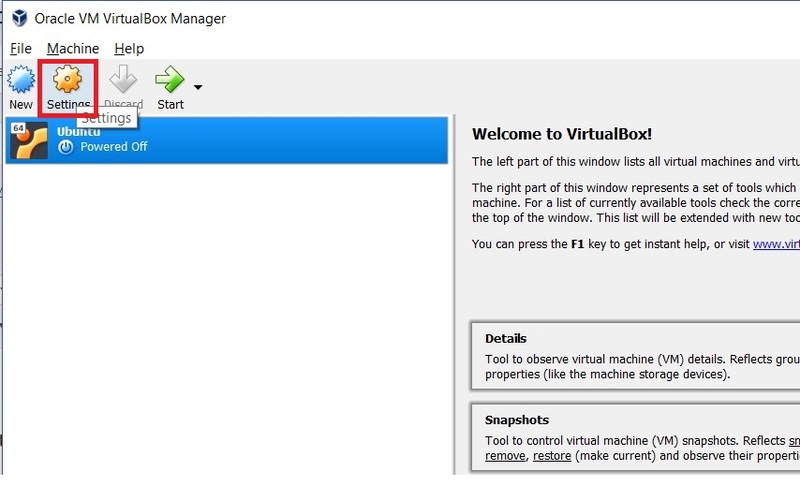 Note that weblogic user will have admin role by default so the screenshots presented here are only demo purpose. Search for the user weblogic and click ok.
You will observe the following error when try to use authenticateOnBehalfOf method using the workflowcontext created using non-admin user. exception.name: Insufficient privileges to authenticate on behalf of another user. exception.fix: Only users with admin privileges can authenticate on behalf of another user. Do we have any timeout settings for WorkflowContext? As mentioned earlier, Workflowcontext is a session object maintained by SOA/BPM server in heap memory. So creating more and more workflowcontexts might cause out of memory errors on the server. So whenever we are done with workflowcontext we should always destroy the context. Also BPM runtime has a default timeout of 60 min after which the workflowcontext object is destroyed. This timeout setting can be modified by navigating to Weblogic Domain -> <<domain name>> -> System MBean Browser -> Application Defined MBeans -> oracle.as.soainfra.config -> Workflow Config -> WorkflowServiceSesionTimeoutInMinutes as shown below. If we use workflowcontext after timeout, we will get WorkflowException. In previous posts (post1 & post2), we have seen how to use SOAP and Remote clients to work with BPM Java APIs. One immediate problem we can see is using server urls in the code which makes deployment across environments difficult. In this post, we will see how to take care of this. WorkflowServiceClientFactory class has different overloaded methods to get the client. When we don’t pass any properties like below, BPM run time will look for a file wf_client_config.xml in classpath of ear file. We can create wf_client_config.xml with the following contents having the server details and information pertaining to both SOAP and REMOTE clients. The file can be placed in a folder like conf under our project folder. Include this file in the ear deployment profile using the below steps i.e. corresponding to ADF BC Service project. Create new file group APP-INF/classes as shown below. Add the contributor pointing to conf directory having wf_client_config.xml file. Now filters section of APP-INF/classes group should be shown like below. Deploy the ear file and re-test your webservice method. During testing, if the following error is seen in the logs make sure that <?xml version = ‘1.0’ encoding = ‘UTF-8’?> is present as first line in wf_client_config.xml file. Since the server details are externalized you can use tokens in wf_client_config.xml and replace them using actual server urls before deploying to specific environments.